Having expanded its presence across the globe, working on projects in Latin America and Asia Pacific, Capital Drilling is returning to what it knows best – the African mining industry. Over the last few years executive director Brian Rudd and the management team have decided that the company, which established in Tanzania, has African mining in its DNA and focusing on its strengths on the continent. While Tanzania acts as a stronghold for the firm with major long-term contracts underpinning business operations, Capital Drilling is active on projects up and down Africa. The London-listed drilling solutions provider has worked with AngloGold Ashanti in Tanzania since 2006, completing various mining related services and the contract was renewed in 2015 to 2020. In addition, in 2008 Capital signed a contract with Acacia at its North Mara project and continues expand its long-term relationship. Further afield Capital is working with blue chip mining clients such as Kinross in Mauritania, Resolute in Mali and Centamin on the Sukari gold mine in Egypt. There are also active operations across a number of other East and Southern African nations occupying Capital’s 94-strong rig fleet. The mining services company’s biggest strengths lie in the suite of drilling work it offers. With an expectation to meet clients’ requirements quickly and effectively, focusing on speed of mobilisation and cost effectiveness, Capital has a comprehensive exploration and mining offering including; air core drilling, diamond core, directional, reverse circulation and underground diamond drilling as well as on site process management services. Rudd is also very proud of the upkeep and maintenance of Capital’s large rig fleet. 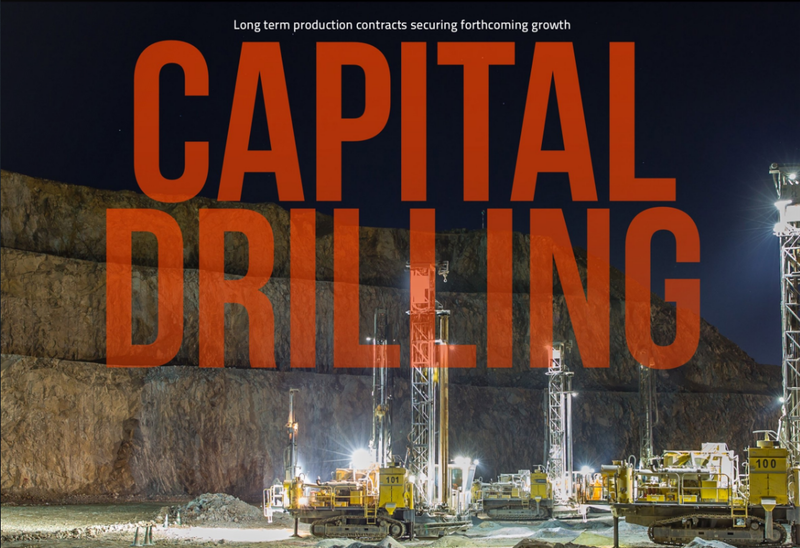 Containing 94 drill rigs, Capital has a comprehensive mobile maintenance and rebuild team which travels around to operational sites and works on the inventory to keep the average age of the fleet down to five years. With reference to Capital’s performance and knowledge of Africa, Rudd says the company differentiates itself in the through its support network and logistical infrastructure. “Where a lot of these smaller businesses, who think they can come out and get straight into the drilling business fail, is in the logistical field [in Africa] and being able to support machinery with the right equipment, maintenance programmes, inventory and supply chains. Over the last 12 years Capdrill has focused on working with the supply chain to establish partnerships with local procurement companies with two benefits. Firstly, the manufacturer can sell into a country without having to set up expensive warehouses and workforces and secondly, Capital has access to inventory and parts which are crucial in maintaining its fleet. Another area where Capital’s competitors have not fared so well in comparison is the ability to adapt to the low price environment that sent shockwaves through the industry in the last few years. Capital’s vastly experienced management team drew up a business strategy that safeguarded the firm against the often volatile fluctuations in the mining industry. The executive management team recognised the cyclical nature of the exploration and mining sectors and positioned the company accordingly. “We were fortunate enough to be a little more forward thinking in our business strategy when we started the company, knowing that it is a cyclical industry and there would be downturns. “We positioned ourselves so we could do the grade control drilling on the mine site and blast hole work which provides long term contracts and continuity and enable us to survive when the exploration rigs were turned off,” explains Rudd. Those long-term contracts, as well as underpinning the business, also ingratiate the company into the host nations and reduce costs by providing real career paths for national employees. Moving away from hiring ex-pats in foreign countries pleases governments, clients and businesses owners by reducing operating costs and providing opportunities for employment and training to low-skilled areas. However, as Rudd says, ad-hoc exploration jobs which last several months don’t afford the necessary timeframe to develop a skilled mechanic or engineer which secure, long term, production-based contracts covering multiple years do. With what looks like the worst of the commodity price downturn over, Capital’s H1 2017 results showed the fruits of the efficiency measures implemented during the downtime. Having offloaded spare capacity in mechanics and accounts and laid more responsibility on management the results have filtered through to the bottom line with revenue increasing 21% from the second half of last year. Now, Rudd is focused on ensuring the company stays competitive on new exploration contracts with the market picking up. Although price is still probably the biggest influence on winning a contract Capital is focusing on how to capitalise on its capabilities, efficiency and innovation to stay ahead of the competition. “We are trying to do things differently which provide more efficiency and more metres in the box for the same price,” notes Rudd. A well-structured and targeted business strategy is bringing about cautious optimism for both Capital Drilling and the overall African mining industry in the coming years. Capdrill has set out a battle plan to take the company forward and sees good indicators for growth in the wider industry. “We would like to see an increased utilisation in our exploration fleet across Africa. Likewise we think there is a lot of potential growth in underground development drilling and areas of production drilling as well. There are a number of customers who are owner-operators of production fleets and we believe that could be a growth area for us. Capital Drilling has secure production contracts stabilising the company, one of the youngest and largest rig fleets across the industry and is firmly set on building on its portfolio of exploration contracts in Africa.